PLAINVILLE – The quick rise of Plainville football features a story about Kenyans and persistence, a little help from retired Hall of Fame coaches Shane Cordell and Larry Friend, great improvement on defense, and plenty of playmaking from electrifying senior quarterback Hayden Friend and several experienced skill players. 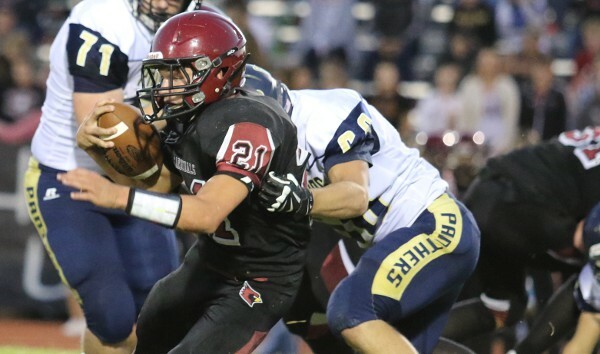 On Friday, the Cardinals delivered their second straight huge home win with a 20-14 victory versus Norton. Last week, Plainville defeated Smith Center, 20-16. Norton is currently ranked No. 3 in Class 3A, while Smith Center was No. 2 in 2-1A to open the year. Norton (1-1) had two drives inside the game’s final five minutes but couldn’t produce a first down. Junior quarterback Jace Ruder, under pressure, took an intentional grounding call on the second drive. Hurt by some drops, the Division I recruit finished 6 of 22 for 132 yards with a touchdown against two interceptions, one coming at the Plainville 20-yard line, the other in the end zone. Norton junior running back Tevin Petrie had 20 carries for 136 yards. Plainville junior Hayden Gillum delivered 2.5 tackles for loss, while freshman Jared Casey had 1.5 TFLs, including a sack. Plainville, unranked to open the season, rose to No. 4 in 2-1A this week. With 1 minute, 32 seconds left, Norton faced a 4th-and-17 from its own 25-yard line. Ruder threw a deep pass that Plainville senior Ryan Buresh defended for an incompletion. Last week’s victory marked just the second time Plainville had defeated Smith Center since 1992. Friday’s win ended a three-game losing streak versus the Bluejays. Last season, Plainville allowed 36 points a contest, including a 46-28 defeat to Smith Center and a 65-28 loss to Norton. The Cardinals were 3-6 each of the past two seasons. After the game, a significant portion of the Cardinal fans stood on the track and chanted, “Stephenson, Stephenson, Stephenson” as he finished a postgame interview on the field. Former Cardinal coach Larry Friend, Hayden’s grandfather, walked up to Stephenson, shook his hand and told him great job. Normally, Friend talks to Stephenson once a week. Last summer, Stephenson spoke with Friend and Cordell, who both helped with the Cardinals’ defense. Last season, the Cardinals had trouble closing out games. Norton outscored Plainville, 31-0, in the fourth quarter. Oakley pulled away late for a 33-12 district victory. Ellis defeated Plainville in the final seconds with a playoff spot on the line. “We’ve had a lot of letdowns last year,” Stephenson said. Before conditioning one day, Stephenson shared a story about Kenyan males that he had heard from his father. “They realized that conditioning wasn’t so bad after that,” Stephenson added. Now, the Cardinals will sometimes end a breakdown with “Kenya” to help keep the energy high in the fourth quarter. After a scoreless first quarter, Plainville took an 8-0 when Friend completed a 99-yard drive when he threw a 75-yard touchdown pass to senior Dylan Wallace. Friend completed 17 of 34 passes for 263 yards with a touchdown and a pair of interceptions. He continually extended plays with his speed and rushed 23 times for 71 yards. Early in the third quarter, Friend read Ruder’s eyes, cut in front of a pass, juked a Norton player and raced 59 yards to the Bluejay 21-yard line. Two plays later, senior Riley Nyp scored from six yards out for a 14-0 lead. Plainville nearly scored again when Noah Hanson intercepted Ruder in the end zone and went 80 yards. Nyp scored again from six yards but the score was nullified because of a penalty. The Cardinals eventually ended the drive with a missed field goal. Norton tied the game on an eight-yard Ruder run following a Plainville fumble inside its own 10, and a 77-yard pass from Ruder to senior Tyus Henson with 9 minutes, 46 seconds left. “We have a bunch of people back, and we are a lot more disciplined,” Friend said. “Telling each other not to crumble, we’ve got to stay together,” Buresh added. Plainville went 80 yards in 10 plays, capped by a 21-yard pass from Friend to Buresh. Friend took the snap and looked left, which allowed Buresh to gain separation across the middle. Plainville’s defense held Norton the rest of the game. When the contest ended, Buresh, by himself, raised an arm in celebration.